Yes you might have come across this story somewhere else but am here to shed more light on this strange end time happenings. 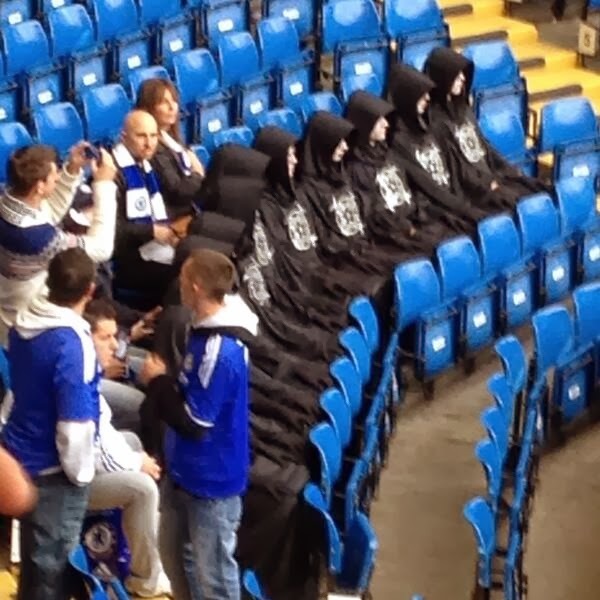 This past weekend, 11 scary-looking men were spotted at Chelsea‘s Stamford Bridge. 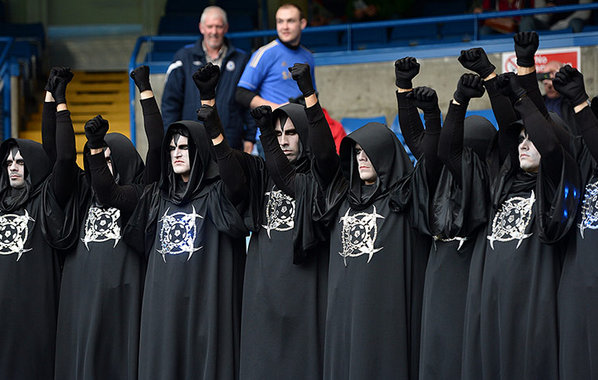 The 11 strange looking men dressed in satanic robes stormed the Premier League clash with Manchester City on Sunday the 27th of October, 2013. 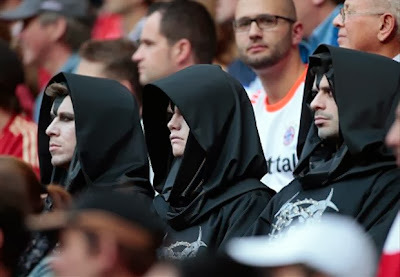 A closer look at these alleged satanists brought to memory the men spotted on Saturday’s match between Bayern Munich and Hertha Berlin at the Allianz Arena. According to sources, the 11 satanists were dressed in black satanic robes with satanic symbols on their chests and hoods. Eyewitnesses claim they were making synchronized moments at irregular intervals during Chelsea’s 2-1 win, while they also stood in unison at random moments. Situated three rows back from the corner flag at the Shed End, the gang could be clearly seen on TV cameras beaming pictures of the crunch fixture all across the world. 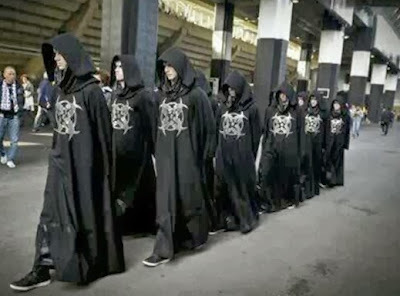 As earlier stated, the 11 satanists also made surprise visit to Stamford Bridge of Franz Beckenbauer, the former Germany World Cup-winning captain and coach. 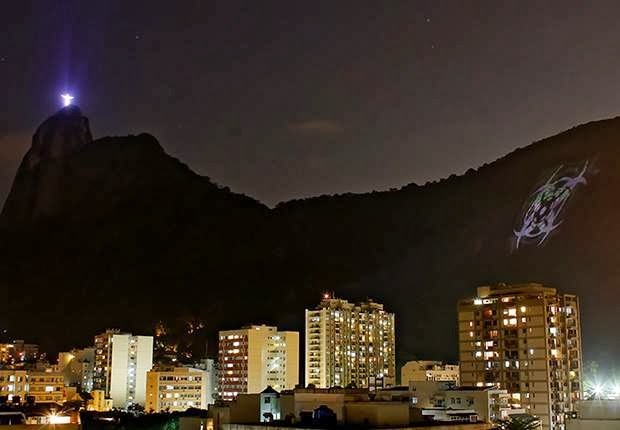 According to sources, these sightings of mysterious satanic symbols and satanists coming boldly to show people who they are happened in London, New York, Rio De Janeiro and other locations across the world. 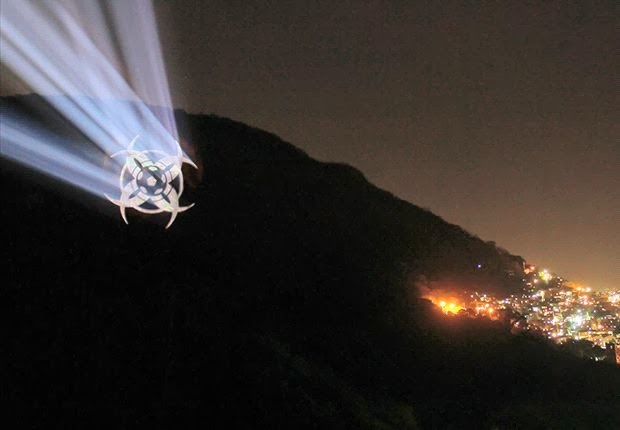 In another end time move of satan and his agents, several illuminated figures were projected over Sugarloaf mountain in Brazil and 11 men in satanic robes have been seen in London and Italy. 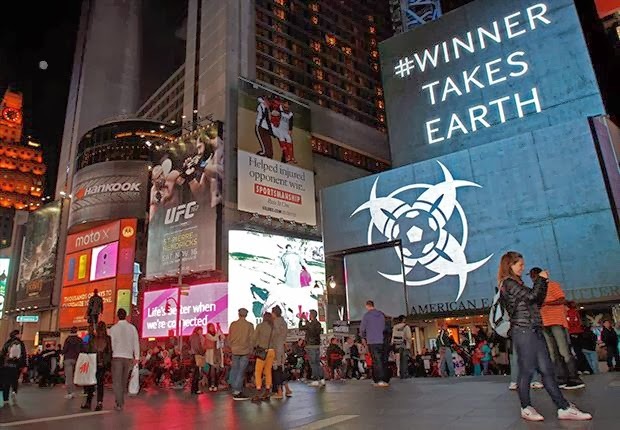 The whole thing started with a bizarre illuminated bio hazard sign in 2 different parts of the world and #TheWinnerTakesEarth sign in Brazil. 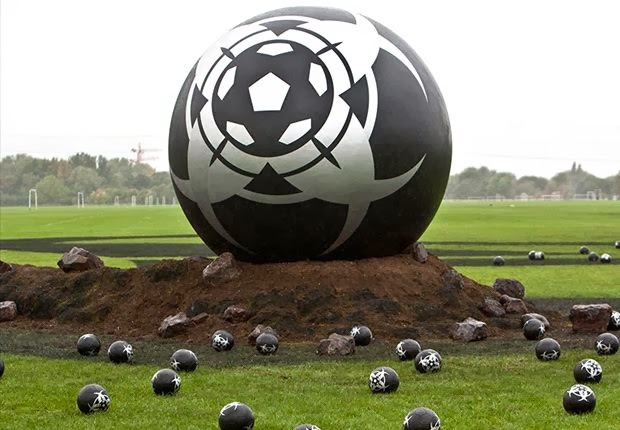 Satanic symbols spotted on a football field in London England. Without doubt, these are signs of end time that every believers must be aware of. Satans and his agents are working behind the scene to carry out their end time mission. Jesus is coming soon. Believers BEWARE! Nt only in london evn Germany italy, d bible is just true dis is end tym d question is dat wer shal we spend enternity ?????? Can you imagine satanists using New York times square as their advert corner. I’m not afraid because my bible said these will happen during the end of times. How prepared are you for the coming of the Lord Jesus Christ? 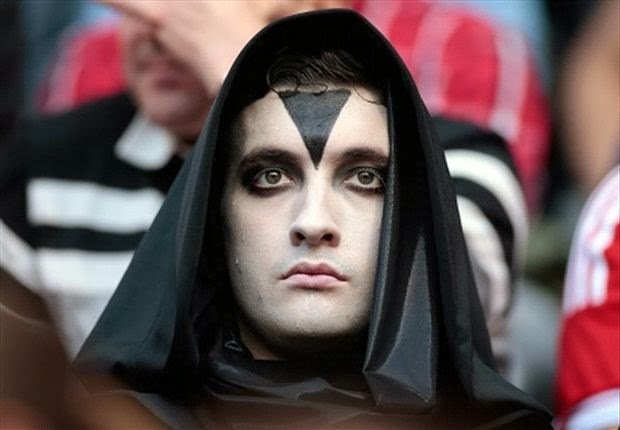 Looks lk dia‘s smtin significantly satanic abt Football in general, nt just Chelsea club. D appearance of dese figures, 2 me it‘s just lk d deviil has come 2 visit his own. Jesus Christ of Nazareth!!! Pls 4gv me Lord. I use 2 b a die-hard Chelsea fan, bt 4rm dis point on…….. “I QUIT“ ova n ova n ova again. @Rop Martin,you said all that is needed in a perfect sentence. 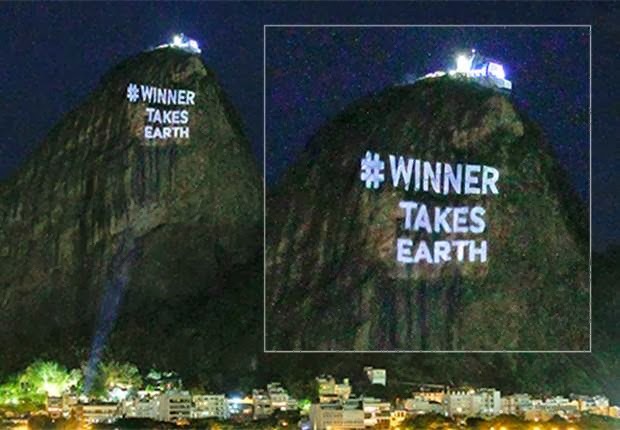 Just imagine, “ WINNERS TAKES EARTH“ wat a maxim? Reminds me of ABBA GOLD of blessed memory. Infact, i‘m done wt anytin Football since it has come 2 dis. Tnk God Almighty 4 dis post. God please help us to make heaven this world is coming to an end. Who is that guy in the illuminated light on top of that mountain? Is that satan? am not surprised all I have to do as a christian is to be more diligent in the study of the word and move closer to God. Evry aspect of entertainment, b it music, movie, or sports, is ownd /managd by d illuminati. So dis dznt affect chelsea alone. It’s taken ova FIFA. Blatter knws. I’m d least surprisd here. Imagin Winner Takes Earth! Let dem take it! God’s kingdom is nt of dis world 4 sure. @Topman. What of that of Alianz Arena. Is that chelsea? I uzed to wander ’bout chelsea’z futbol & their winnin streak buh now it’z dawn on me ‘that chelsea club belongz to ða devil’ & i ain’t surprized one bit… Juzt imagin ðat sunday’z match againzt Man City ofcuz they deserved winning..
THAT I SHOULD READ PSALM 78 V 2 , AND IT WAS WRITTEN , I WILL OPEN MY MOUTH IN PARABLE , I WILL UTTER DARK SAYINGS OF OLD. with all due protocole been observ,i think the world is coming to an end nd what we need now is just pray,nd also stop praying 4 longlife,so we won,t be part of time. mrs ohio or whatso eva u cal ur self, ur a parthological lier, a fat one. Always try to get ur fact right b4 u com out here to talk trash. How can u be such a feeble-minded some to an extent dat u allow ur self to be brain-washed into believing dat christanity was introduced by freemason. Aaah so so sad to hear dis fooooosh from some one like u. Christanity is neva and hav neva been introduced by any freemason or whatsoeva, if u should know, after d Death of Jesus Christ , d apostles and disciples got afraid and ran to hide but on d third day My Saviou rose from death and apeared to his hidden disciple and promise to send a comforter, which is holy spirit to them and he ascended back to heaven.after forty days which is on a penticost day holy spirit came opun every member of d apostles and disciples and they bcame bold enough to go about preaching Christ and gospels to people. This is how christianity took d whole world bcos God himself is behind christianity. God the FIREsun-devil is the true satan/devil!! = the colour of the firespidding firesun thats the bad power in the world!!! then it should be allowed to say the TRUTH!!!!!!!!!!!!!!!!!!!!!!!!!!!! WOOOHHHHH THERE GOES THEM SATANISTS YET AGAIN!!!!! 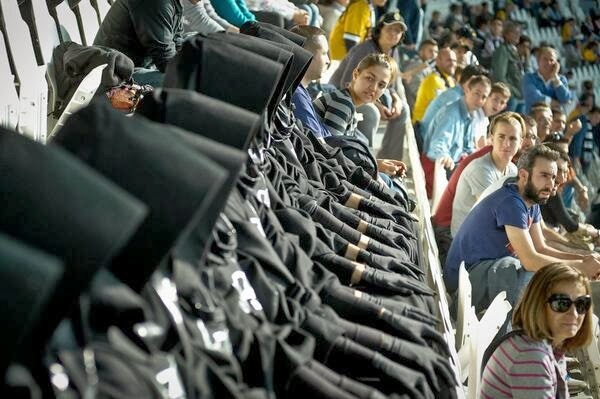 The brother-hoods reserved to be respected in their faith and rights, who ever judges them should be acknowledged ***** is the master of the world/planet who ever judges Us! time for no mercy or faver is soon!